“Good days ahead” this was prime slogan and dream given by BJP government before coming in to power. Every Indian believed in this dream and voted BJP.To turn good days hope in reality people were waiting for budget 2014. 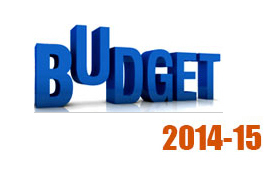 Finally today Budget 2014-15 is announced by Finance Minister Arun Jaitley of Narendra Modi’s government. Many of us expecting tax relief, inflation control, infrastructure development and much more from budget 2014.Up to some extent this demand was addressed in budget 2014. Let’s Review Union Budget 2014-15 & its impact on you in detail. Majority of people have demanded to increase tax exemption limit from 2 lac to 5 lac but tax limit was enhance only by 50,000 Rs/-. As per new budget tax exemption limit for individual is raised to 2.5 lac from 2 lac. Tax Rate (Slab) remains unchanged. Increase in Investment limit 80 C from 1 lac to 1.5 lac. This is very good tax relief given by government to tax payers. Now one can save 1 lac more from income tax. 50,000 Rs/- direct exemption and 50,000 Rs/- by increase in investment limit of 80 C.
This will not only help people in increasing purchase power but also help them indirectly to save more money. Another major change from tax point of view is tax exemption limit on interest component on housing loan. This limit is raised to Rs 2 lac from Rs 1.5 Lac. Home loan borrower will get now additional advantage of this enhance tax limit. Apart from income tax limit change it is proposed to change custom duty, excise duty, service tax on several product and services. Following thing will become costlier after budget. Following thing will become Cheaper after budget. Like every year this year also finance minister has done his work of making budget of 2014-15. Somehow he manage to reduce tax burden in this budget, but yet few worry of common man is kept aside in this budget. (1) Ever growing inflation is biggest worry of common man. In this budget provision of 500 Cr is made for price stability fund to reduce inflation but nowhere it is shown that what type of step government will take to reduce inflation and how this fund will be used. (2) Black money and corruption is killing our actual economy. No provision is made in budget to expose black money or to prevent black money transaction. This budget is actually on same philosophy you save money to earn money. (3) No provision made to increase tax payers. Not only that statement is made that Income Tax Department is expected to function not only for enforcement but also as a facilitator. (4) Provision of 200 Cr is made for Sardar Patel statue in Gujarat. 200 Cr can be used for employment generation or for infrastructure development. (5) 500 Cr provision is made for IIT,IIM but what about employment generation? Still lot of question are unanswered in budget 2014-15. Do share your views on Union budget 2014-15.